Checking off a Bucket List Item – The Singin1 on the Road! RB got the day off, a chance to set under the cool canopy of a parking deck while Momma and I rode a tourbus from Las Vegas to an old entry on my Bucket List–The Grand Canyon. We rode past Hoover Dam and the Colorado River while the driver gave us history of road construction around the dam and played a PBS documentary about the site’s construction. After a rather limited night’s sleep last night, I didn’t hear the entire film. The trip took us into Arizona–my first visit to the state. We had lunch in a small town then continued on to the canyon. Momma’s visited the canyon before, so she let me explore mostly on my own. 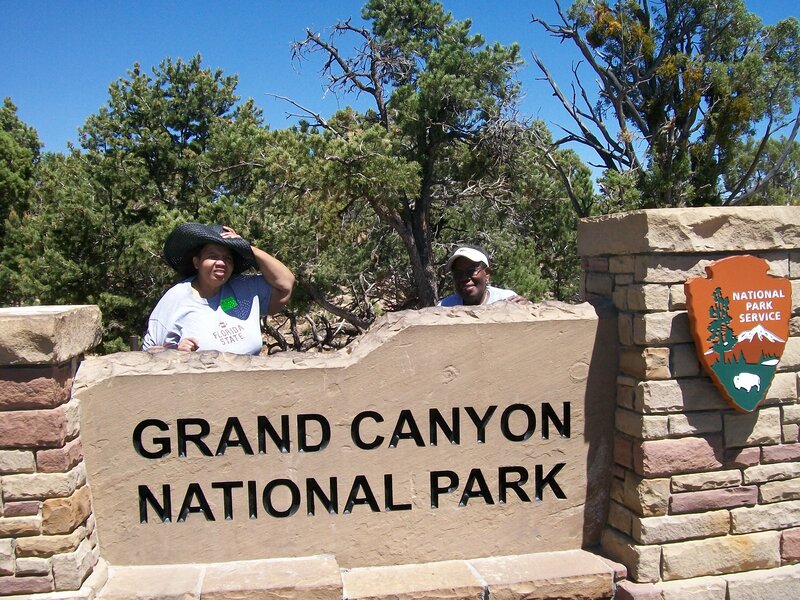 We visited two sites on the canyon’s South side, so we missed the opportunity to walk out on the glass walkway–which is on the West rim–an opportunity I’d hoped I would have. Despite this, the Grand Canyon is truly grand and one of those places that doesn’t disappoint. It was a pleasure to take it off my list. In some shots, the Colorado River is again visible far below in the canyon. Back on the bus, we made our way back to Vegas. It was late when we were finally dropped off at the hotel. Momma availed herself of the casino facilities while I headed to the room in the hope for a few extra hours of sleep.